In our discussion of 20th century Irish nationalism, we often talk about Irish nationalism springing from the Irish Catholic identity – a sense of past wrongs that needed to be righted. But where did this sense of collective injustice come from? Where, moreover, did the idea of being “Irish” as something fundamentally and intrinsically hostile to something else called “British” come from? Many would trace these ideas back to the 1600s, when war, land confiscation and religious conflict left enduring legacies in the Irish memory. Where, moreover, did the idea of being “Irish” as something fundamentally and intrinsically hostile to something else called “British” come from? 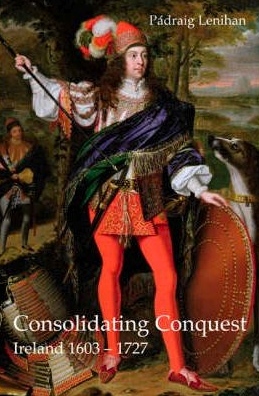 In this interview, we spoke to Padraig Lenihan, historian and author of Confederate Catholics at War 1641-49, Conquest and Resistance: War In Seventeenth Century Ireland, 1690, Battle of the Boyne, and most recently, Consolidating Conquest, Ireland 1603-1727. Listen to our second interview with Padraig Lenihan here. Ireland had a long and turbulent 17th century. The century opened with the end of the Nine Years War (1595-1603), and the crushing of Hugh O’Neill and the last challenge of traditional Gaelic chiefs to the English state in Ireland. After his flight to Spain, O’Neill and his allies’ land were confiscated and given to Protestant settlers from England and Scotland. The ‘Protestant Interest’, both in number of settlers and in land held, was consolidated over the following hundred years –largely at the expense of the indigenous Catholic elite. Catholic grievance led to rebellion in 1641 – an event which helped to spark civil wars in England and Scotland as well as Ireland. The subsequent civil wars from 1641-1653, saw Irish Catholics side with King Charles I against his opponents in England and Scotland. The Irish Catholics briefly ran their own state – The Confederate Catholic Association, from 1642-1649. This was brought to an end though when Oliver Cromwell, on behalf of the English Parliament, smashed Catholic and Royalist resistance in a brutal but effective campaign in 1649-53. In the aftermath of the war, almost all Catholic land was confiscated and granted to Protestant settlers. Catholics received some redress after the Restoration of the monarchy in England in 1660, but their big chance for over-turning the Cromwellian settlement came when James II, a Catholic monarch came to power. James, however, was deposed by the Protestant William II, sparking another war between Catholic “Jacobites” and Protestant “Williamites” in Ireland (1689-1691). The Catholic defeat in this war all but finished off the old Catholic landed classes and secured “British” and Protestant rule in the country. Written by: John_Dorney on 12 May, 2010.on 3 June, 2013. 5 Responses to "Padraig Lenihan and the 17th Century in Ireland"
Was the second part of this interview supposed to cut out at 6:58 when Padraig starts to answer your question about our relationship now to the issues of 17thC Ireland? Was this a tech problem? If so pity, as it sounded like it was going to get real interesting. No what happened actually was that Padraig was under time pressure and had to wrap things up. But we do talk about the importance of memory and the legacy of the 17th century in the interview, ‘war in 17th century ireland’.